As I posted earlier in the year, I used to be a Netflix subscriber. I was on-board from day one and enjoyed the early days of getting DVD's through the mail. After my kids were born I had to scale back and became a Redbox devotee. Well after receiving a Bluray player from my Mom for Christmas complete with Netflix streaming built-in, I decided to give my old friend one more chance. So far, so great as I am very happy with my decision to return. I wanted to sign up again to take advantage of Bluray rentals, but in all honesty, the online streaming is what is winning me over. My Samsung player comes integrated with a Netflix button that allows me to view all of the titles I have in my online queue. Netflix now offers both a DVD (Bluray) queue for mail delivery and a Watch Instantly queue. 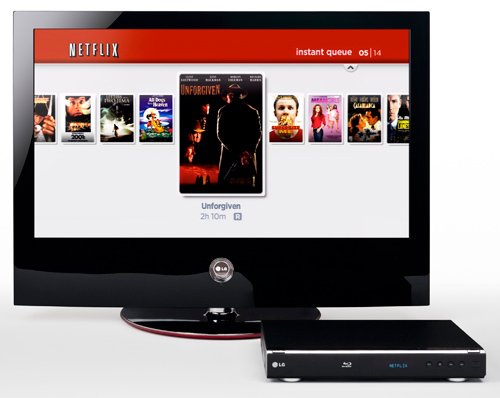 Netflix has an online streaming catalog of thousands of titles from new releases to TV shows. I spent some time up in Jersey over the break downloading a few documentaries I had wanted to see and watched them instantly on my laptop. The buffering time is minimal (a minute for a movie to start-up depending on your connection) and it's easy to fast forward and rewind. Even better than watching instant movies on my laptop is launching them through the Netflix player on my Samsung Bluray machine. The quality is VERY good and the interface is pretty slick. You can even rate your movie with the player's remote when you're done. A very cool feature is watching TV series on DVD. Rather than waiting for disc 2 of 4 of a television season to arrive in the mail, you can select one of all the episodes of the season instantly. I was able to catch up on some episodes of Man Vs Food that I hadn't watched before. Unfortunately, not every TV series is available to stream (you CAN get most series through the DVD queue though). I seriously need to start watching The Wire sometime and online streaming would be the best way to do so. Netflix is really pushing their online capabilities and is facing a battle with some of the major studios to keep bringing new content to subscribers. I was considering going with Blockbuster as a rental option (the Samsung player also has Blockbuster Online built-in) but while Blockbuster offers a cheaper monthly rate ($8.99 for Bluray rentals instaed of $10.99 for Netflix), the Blockbuster online On Demand service is a pay-per-view model with movies costing $1.99 each to stream online. Netflix gives me their ENTIRE catalog for FREE (bundled with my base monthly charge of $10.99). Blockbuster really can't compete with this service. Add the amazing streaming capabilities of Netflix to the lightning quick next-day Bluray disc processing through the mail and you have a perfect situation for someone who is just getting into the realm of Bluray. It's good to see my old friend Netflix again and it's great to see that the company seems to be better than ever. Aaron and I have been using watch instantly for The Seeker - good to watch now while there is no TV. Movie selection is not great. Problem with Redbox is that often the movie we want to see is gone and you have to wait in line forever while some idiot reads through every movie option when all you want to do is return your damn movie. Once our 5 free Redbox rentals are up we are just staying with Netflix.